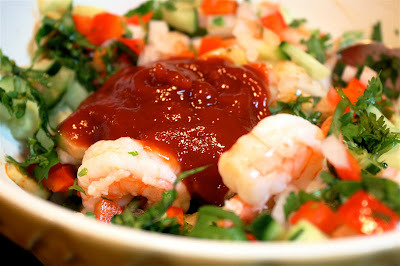 This is an easy shrimp ceviche that has a great, south-of-the-border medley of flavors and just enough spicy pop (and presentation pizzazz) to warrant a solo performance as a pre-dinner appetizer. Unlike what many might consider a traditional ceviche, however, this one calls for using just a little heat to cook the shrimp... rather than relying solely on a citrus bath. 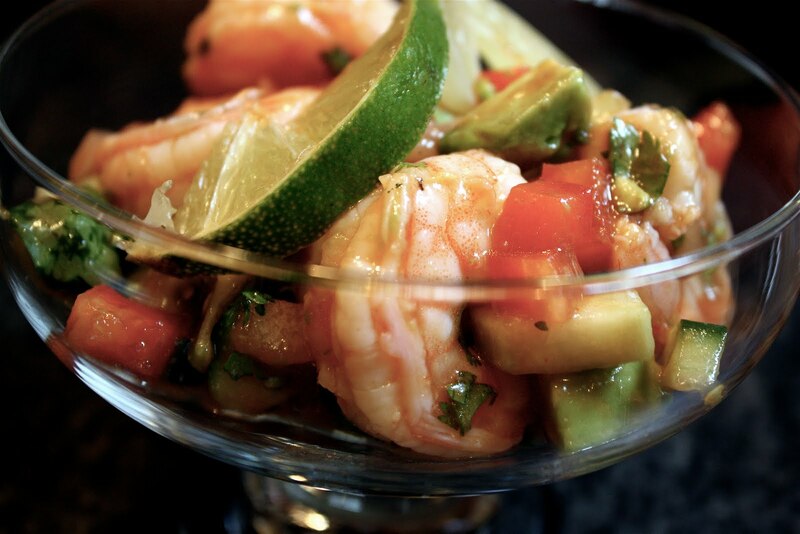 In most traditional ceviches, the seafood of choice is "cooked" in a bath of citrus juices (usually lemon and/or lime) until it firms up and becomes opaque. Depending on the type and cut of fish, this process can take anywhere from 15 minutes to three hours...or even overnight...and will essentially "cook" the fish, though it won't kill bacteria like heat will so it's especially important in this method that your seafood is fresh, fresh, fresh. For this particular ceviche, though I don't recommend skimping on freshness, I do blanch the shrimp for just a few minutes in boiling water that's been infused with a bit of lime juice. It just speeds up the process, gives me a little peace of mind, and I think also helps to maintain the texture of the fish. It's a quick little dip and then they are off to marinate in some fresh lime juice for no more than an hour. This way they get the benefit of that great lime tang without having to sit in an extended bath... which can overpower their flavor if left too long. 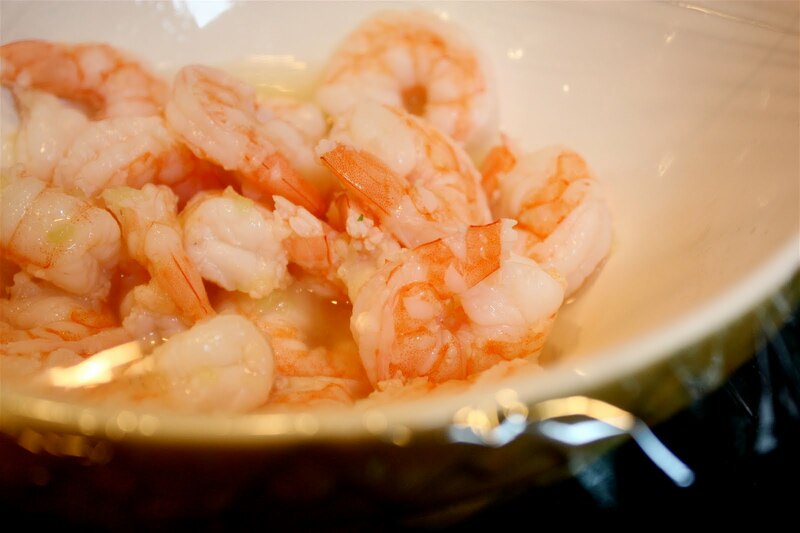 While your shrimp marinates, you can prep the rest of your ingredients so they're ready at hand when you want to serve this up. It's super easy... everything comes together in one bowl for a quick toss. You can serve it up immediately, or keep it chilled in the fridge... adding the freshly diced avocado to the mix just before you plate up. Apart from the marinade time, this dish is super quick (and easy) to pull together... making the thought of what to do for appetizers kind of a no-brainer. It's one solo performer that will easily outshine a tabletop of everyday munchies. Again, many of my clipped recipes are devoid of dates or sources but I believe this is from an old Cooking Light magazine. While that recipe called for a pound of medium shrimp, I calculate at least 4 or 5 large shrimp per person. In addition, I've ramped up the heat factor a bit, and added in a few more ingredients to lend this ceviche its great south-of-the-border flavor. 1. 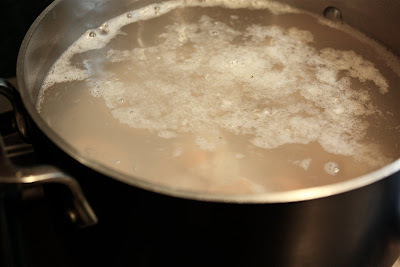 Set a large pot of water to boil over high heat. Once boiling, add 1/4 cup of the lime juice and all the shrimp. Boil for 1 to 2 minutes. Remove from heat, rinse with cold water, and drain. 2. 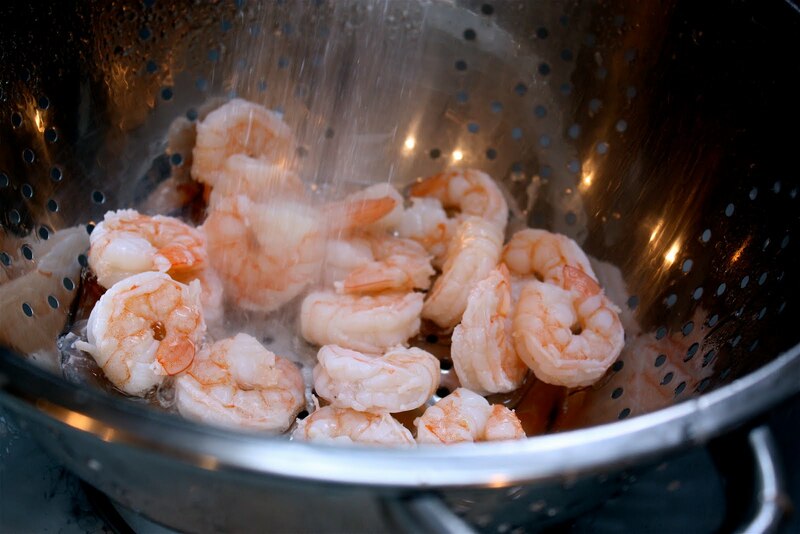 Transfer shrimp to a large bowl and toss lightly with remaining 1/2 cup of lime juice. Cover with plastic wrap and place in fridge to marinate for 1 hour. 3. Rinse and drain chopped onions. Combine onions with cucumber, jalapeño, red pepper, and cilantro. Add ketchup, hot sauce, and olive oil. Toss lightly to combine. Season with salt. If ready to serve, add fresh diced avocado, and toss lightly to combine. 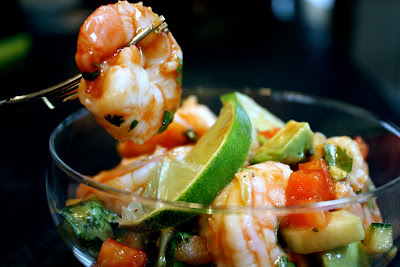 Portion out ceviche to individual serving dishes, careful to have 4 to 5 shrimp in each dish, and garnish with fresh lime wedges. Note: I've packed up this appetizer to-go on many occasions. Simply nestle your serving dishes in a bed of crushed ice set in a large pan or tupperware-like dish. Place the pan/dish in the freezer to keep until you are ready to transport your appetizer. Then, when ready, fill your dishes, cover with wrap... and go!